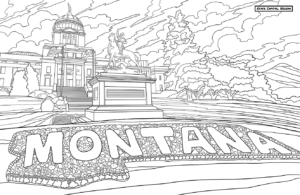 Blog The Montana Coloring Book is here, and it is amazing. We love Montana and we’re always trying to find new ways to show it. For years we have proudly produced books that showcase this great state and her many wonders. After the success of Dinosaurs Live! we were excited to find a new project for one of our favorite artists, Ted Rechlin (Tyrannosaurus Rex, Jurassic, Bears). Being a Montana resident, Ted was happy to take on the challenge of capturing the magic of #BigSkyCountry. And boy did he! With the Montana Coloring Book, Ted draws upon the countless natural wonders, wild histories and adventures to be found across this great state. 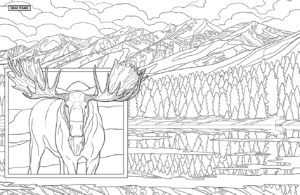 Whether you love national parks, grizzly bears and bison, or hiking and hunting, there is something special just for you within the pages of Montana Coloring Book. Working with Director of Publication, Kathy Springmeyer, Ted illustrated some of his favorite locations (in scenic ready-to-color pages) from across the Treasure State. 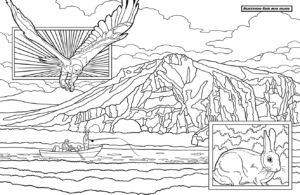 Showcasing 32 amazingly detailed full-spread locations, Montana Coloring Book features both famous vistas (Lone Peak, Big Sky) and world-class wildlife (Roosevelt Arch, Yellowstone National Park). Readers of all ages can lend their creative magic to favorite spots such as the Paradise Valley, Lewis and Clark Caverns, Makoshika State Park, Glacier and Yellowstone National Parks, and many more classic landmarks. 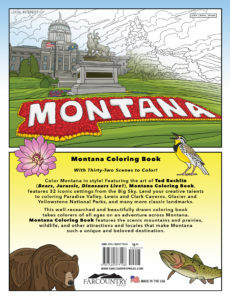 Perfect for commemorating a family vacation, or celebrating the state you love, Montana Coloring Book is printed in the United States, on a special heavy, color-grade paper and designed in an exciting “comic-book” style. So, gather up your best colored pencils, pull up a comfortable chair and see what you come up with! 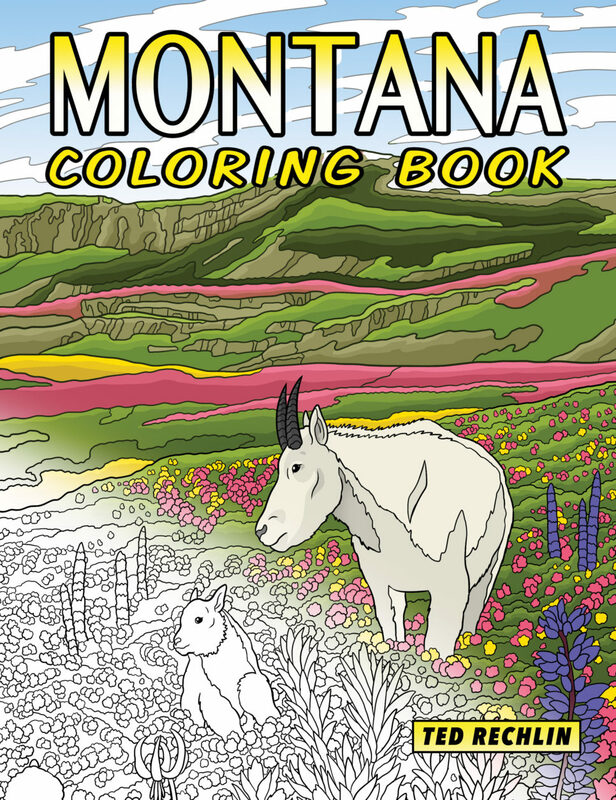 Whether seeking to find a Zen-like peace while coloring the intricate valleys and streams, or wanting to experience Montana’s wonder for the first time, this well-researched and beautifully drawn activity book is perfect for colorists of all kinds. Oh, and one more thing…don’t forget to share your creations! Tag us on social media (@farcountrypress) or email [email protected] with your best work…there just might be a spare prize pack around for our favorites. Montana Coloring Book (ISBN: 978-1-56037-710-8, $9.95, Farcountry Press, 2017) is available at local bookstores and gift shops, through online retailers, or from Farcountry Press at 1.800.821.3874. 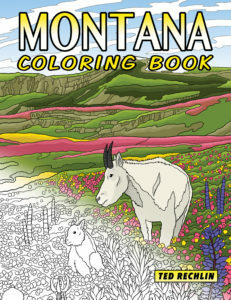 Click Here to purchase the Montana Coloring Book on Amazon.com! Author and illustrator Ted Rechlin has been drawing pictures and telling stories since he was three years old. While his drawings have gotten much better, his stories haven’t really changed much. They’re still about superheroes, bears, wolves, sharks, monsters, and lots of course, dinosaurs! Ted feels very fortunate to live a life where he now gets paid to draw his pictures and tell his stories. He has contributed his work to many museums, zoos, and publishing companies like DC Comics and Dover Publications. 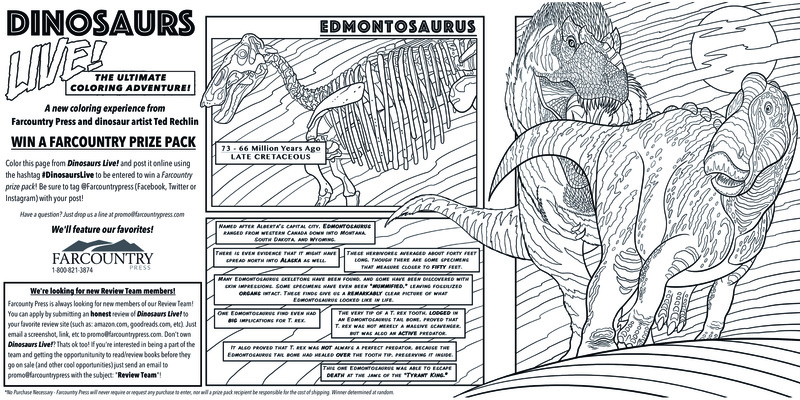 With five of his own educational children’s books under his belt, including Farcountry Press’ Dinosaurs Live!, Ted is excited about his newest release from Farcountry Press, the Montana Coloring Book. What is the Farcountry Press Launch Team? Celebrating more than 30 years in business, award-winning publisher Farcountry Press specializes in softcover and hardcover color photography books showcasing the nation’s cities, states, national parks, and wildlife. We also publish several popular children’s series, guidebooks, cookbooks, and regional history titles nationwide. Farcountry also distributes books for several publishers, including Northern Rockies Publishing, Quick Reference Publishing, and Sweetgrass Books, Farcountry’s custom-publishing division. Farcountry produces more than 50 books annually; the backlist has grown to more than 300 titles. Visit www.farcountrypress.com or call 1.800.821.3874.